I bought this tea recently on a trip to Cost Plus. 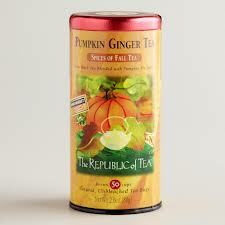 They had a variety of fall teas and I always like The Republic of Teas selection. I tried this tea a variety of ways, it is very subtle, I pick up hints of flavor, I wanted something a bit bolder but it makes a great fall drink. I brewed up a cup of coffee, let the tea bag infuse for a few minutes and added soy creamer! It was pretty tasty and a perfect fall spice drink! I love this tea!! I haven't seen it in years so I'm glad they still make it...YUM! Adding it to coffee is a brilliant idea! It sounds so good. I need a jaunt to Cost Plus. I like tea & coffee...So mixing the two is natural. I think a lot of people dig on pumpkin spice drinks this time of year so why not do something at home!